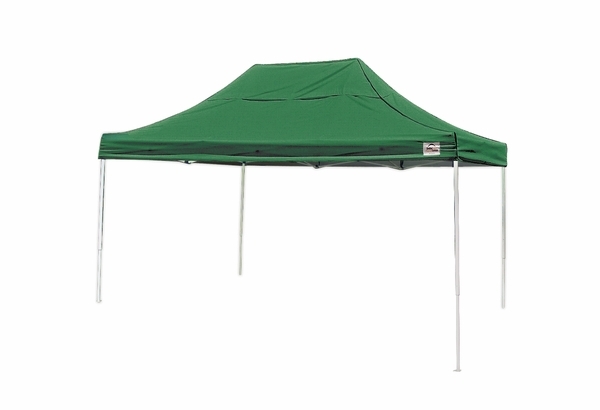 This high quality Straight-Leg Pop Up Canopy Tent is part of the Pro Series. It is made by ShelterLogic, the premier manufacturer of portable sheds, garages and other temporary shelters. 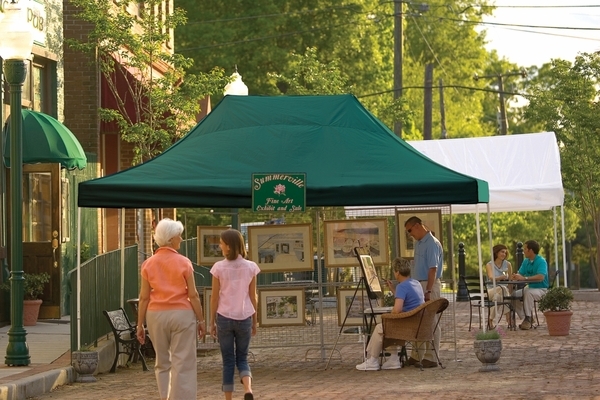 The collapsible frame makes this canopy ultra portable. The steel from is tubular construction. The synthetic joints make the structure flexible to resist strong winds. The steel frame features a baked on powder DuPont thermoset coating that will not rust, chip, peel or corrode. Do you carry weights that fit the legs on this canopy? Yes. These weight bags are our most popular choice. Are you able to add the name of our school to one side of the ShelterLogic Pro Canopy tent? Please go to our website and click on the orange wording "Custom Graphics" at the top of our page below our phone number to submit your request for a graphics quote. I apologize, sides are not currently available for this canopy. Does this ShelterLogic Pro series straight-leg pop up canopy tent pool water in the rain? Thank you for your inquiry. 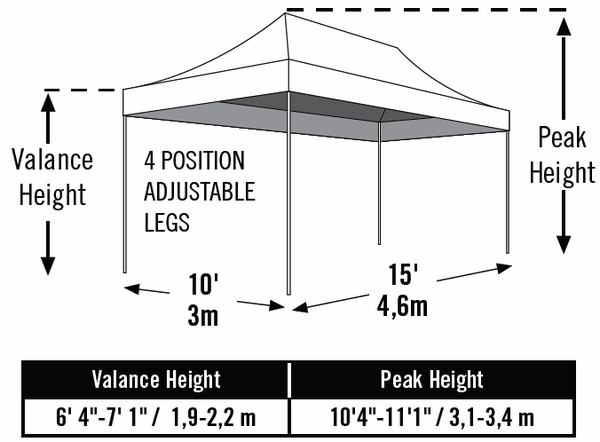 The ShelterLogic Pro Series Straight-Leg Pop Up Canopy Tent - 10 Foot x 15 Foot will need the water manually knocked off the top so water will not pool up on the top. All of the instant canopies will need the water to be knocked off so the water will not cause damage. There is not a sidearm option available for this unit as well. Do you have to take the canopy top off the frame every time you take it down? You do not have to but it is recommended that you do to help preserve the life of the canopy and to avoid it being damaged by getting pinched in the framework. 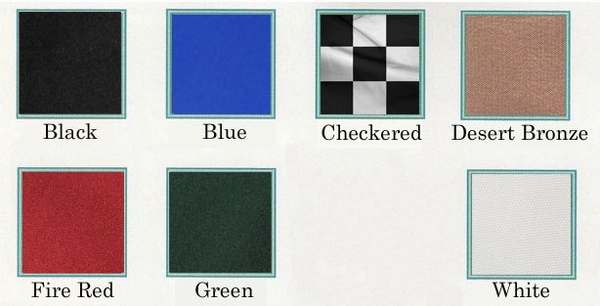 What is the interior clearance of the canopy? I need a 7 ft clearance from this. This has a maximum head clearance of 77 inches. Not quite 7 feet. You might be interested in one of our fine Caravan Canopies which have a 7 foot clearance. I want to set this tent up on my wooden deck. What do I need to use to secure my tent? The only method of anchoring this to wood is weight. What is the weight of this tent? The ship weight of this item is 80 pounds. The weight less packaging is 73 pounds. What is the difference between the truss ceiling tent and the non truss ceiling model? What one is better or stronger? The trusses are the structures inside the canopy that support the canopy top itself. A fully trussed ceiling consider more sturdy. Some people, however, prefer and open trussed ceiling as it allows more clearance inside. How will this canopy hold up in the winter months of WI? While this tent makes for excellent portable shelter, it is not rated for semi-permanent applications and is not snow load rated. I would highly recommend utilizing one of our strong garage type canopies that are rated for extended outdoor use. Does this come with a rolling bag? What do sides cost? Yes, the canopy does come with a roller bag. Sides are not currently available for this canopy. This tent was easy to set up and take down. The quality of this product is excellent. The storage bag that it comes with has separate compartments for all pieces so it is easy to keep organized. The most impressive thing about this purchase was the customer service I received. I had questions regarding my purchase and their response was extremely quick and very helpful. They were willing and able to make adjustments to make sure my purchase was exactly what I wanted and I was able to get it as soon as possible. i will definitely recommend this tent and this company. It was a little difficult to get up at first, but then we got the hang of it. Very sturdy and heavy. If it rains the water pools on in the fabric and doesn't run off. You need to push the water off with a pole or broom. Otherwise I like it. Great shelter, easy to set up and take down. The packages are very nice for transporting. Good value. Really a nice big pop up canopy. Plenty of room to sit under in the hot sun. Easy set up, Easy to take down. ProsEasy set up and easy to take down. Love the color. ConsIf top is not tight pockets of water develop during rain. If home during rain, drop two legs to put on angle. The product is good value..... The catalog description is accurate, easy to erect and disassemble and the handy roller bag really makes this an easy to transport to the site. I've only used it once but with user care, I believe it will provide years of good service. I don't believe you'll find better value than offered here. I've ordered multiple times from this company and each time shipment and delivery was fast and accurate. Quick delivery, nice canopy. Easy and quick assembly. The actual canopy part has poorly stitched seams and appears like it will not hold up long term. The plastic joints are rugged as well. Overall it is a great bang for the buck!